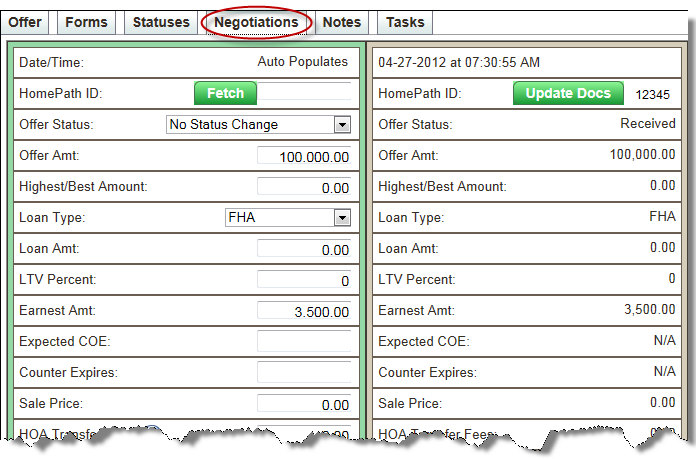 If you receive a counter offer for a Fannie Mae property, you will need to run a Fetch with the new HomePath ID to update your offer information and retrieve all of the new documentation. 5. Enter your HomePath Login Name and Password. 6. Click in the box next to the Fetch button again and enter the new HomePath ID. Previous offer information can be tracked by reviewing the various panes on the Negotiations tab. Any documents that were uploaded with the offer are shown in the Attachments section at the bottom of the note on the Notes tab. Attachments can be downloaded by clicking the document's green arrow.